Lock in a great price for Hôtel Les Rochers – rated 9.1 by recent guests! Comfy rooms and you could heat water to make coffee and tea. 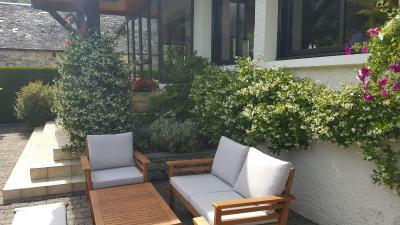 A beautiful small hotel with beautiful plantings all about as well as art. Lots of reading material in the public rooms. The English owners are very hospitable and knowledgeable about the area. They also make available breakfast and dinner for their guests. St. Savin is one of Frances' "beautiful villages" and a big destination for cyclists in the summer and early fall. Consequently there is often a group of them at the hotel. They are generally in bed at a reasonable time and up and out fairly early so it is easy to work around them. A quaint little town. John and family are excellent hosts. The breakfast was excellent and complete with coffee, bread, eggs, cheese, and sausage. The room was small but functional with a great view of the surrounding moutains and valley. John directed us to a walk around Lac D'estaing. The drive up was beautiful as was the walk. Brit ex-pats John and Jane are a warm couple who run a beautiful, boutique hotel. John cooks very good home cooked dinners and both work hard to keep their guests happy. The facilities are spotless, adorable and have mountain views from the dining room. Dinner was homemade and delicious--it's worth the value for the money. 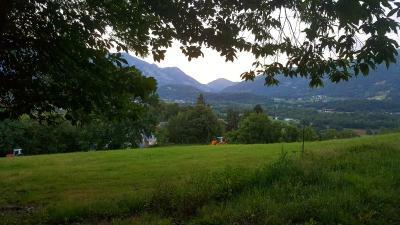 The view from our room was fantastic, fresh air of the Pyrenees. it was simply delightful! Very kind, friendly, flexible and English fluent staff. Excellent dinner and breakfast with very reasonable price. Clean and cozy facilities. 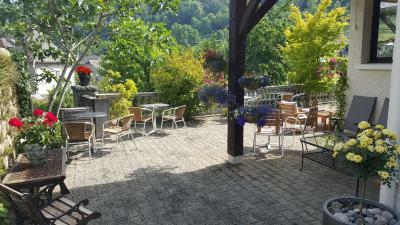 Lovely hotel in a beautiful village perfect for basing ourselves for cycling in the pyrennes. Good varied breakfast buffet and tasty evening dinner. Charming hotel run by welcoming hosts. Enjoyed our stay very much. Quaint, owner/operators were delightful. Food was excellent. Our dinner was truly exceptional - an unexpected bonus. While the decor is dated, I wouldn't hesitate to stay again. The location is great and the town is charming. Located in the center of Saint-Savin, Hotel Les Rochers is a 16-minute drive from Lourdes and 2.2 mi from Argeles Gazost. It offers free Wi-Fi, a flowered terrace and a library. All rooms feature a wardrobe and a private bathroom with free toiletries and a bath or shower. Laundry facilities are available at an extra cost. A continental or buffet breakfast can be enjoyed every morning at Hotel Les Rochers. French cuisine is served in the hotel’s restaurant, with a different evening menu every day. Packed lunches can also be requested. This property is 22 mi from the A64 motorway. Hiking trails can be found in the area and free public parking is available on site. 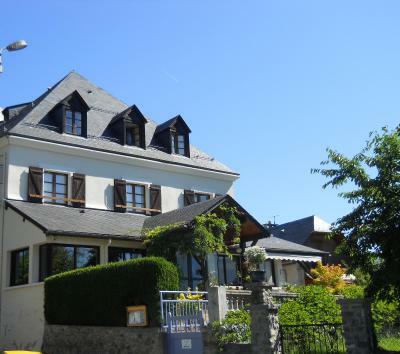 This property is also rated for the best value in Saint-Savin! Guests are getting more for their money when compared to other properties in this city. When would you like to stay at Hôtel Les Rochers? Located on the first floor, this room has one double bed, interconnecting door and a further two single beds. It also offers wardrobes, free WiFi, satellite TV, a private bathroom, 2 toilets and tea and coffee making facilities. Located on the second floor, this room offers a wardrobe, free WiFi, satellite TV, a private bathroom and tea and coffee making facilities. Located on the 1st floor, this room offers a wardrobe, free WiFi, satellite TV, a private bathroom and tea and coffee making facilities. Hotel les Rochers is a charming and artistic retreat, you'll find us hidden away in a quiet conservation village that boasts beautiful views into the Hautes Pyrenees mountains and valleys. We have an eclectic decor for guests to enjoy, which includes books, paintings and ceramics in both the restaurant and the bar. House Rules Hôtel Les Rochers takes special requests – add in the next step! Hôtel Les Rochers accepts these cards and reserves the right to temporarily hold an amount prior to arrival. Please note that the hotel is located in a mountain village without any public transport. Breakfast could be better if you ask!!! Immaculately clean and comfortable. The family suite was perfect and the John and Jane are fantastic hosts! Our bedroom had very shear curtains on the windows so if you are light sensitive, bring a night mask for sleeping. Some ventilation in the bathroom would be a nice addition. The hosts are great. Friendly and personal is a nice way. Went out of their way to help us with very early breakfast needs (05.30am). Breakfast was good. Dinner was very tasty and worth every €. Nice and relaxing atmosphere. We would come back when returning to Pyrenees. 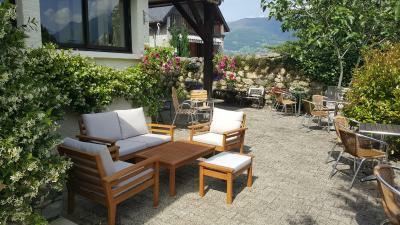 A superb hotel for a cycling base in the Pyrenees.John and Jane run a fantastic hotel where the service is exceptional and you are made to feel extremely welcome. 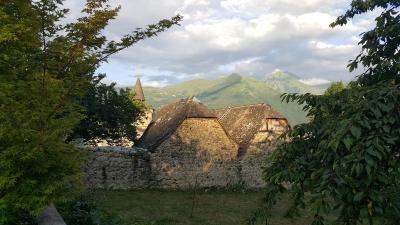 Saint Savin is a beautiful village and it is good knowing that every night you will come back to experience John's fantastic home cooked food-which is prepared to the highest standard. Owners couldn't have been more helpful with guidance re the area, ice for water bottles etc. The owners gave us an excellent feeling. A cosy and well designed. Would have appreciated it if the Hostess had engaged with us - even a smile or a hello would have sufficed! John was a very friendly host and we enjoyed the hotel's relaxed and comfortable bar with great music. Lovely room with a mountain view. Rainy weather, without asking i found my motorbike’s saddle neatly covered under a plastic bag. It is all in the little details! Set in a beautiful area of the Pyrenees. Meals excellent, but suggest you have a light lunch!